25 April - 13 September. 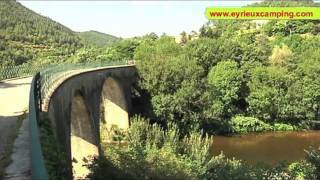 This FranceLoc site is set in the scenic, steep sided Eyrieux valley. There is a sandy beach beside the fairly fast-flowing river but the swimming pool complex may be preferable for either sedate bathing or exciting slides. There are 56 steeply terraced and shaded touring pitches with 10A electricity. The steep walk up from most pitches to the original old farm buildings housing the reception, restaurant and bar is rewarded by a terrace with a spectacular viewpoint. Sporting and play areas near the river and an unusual themed adventure play area, children’s clubs and evening entertainment should appeal to all. The touring pitches occupy the central area of the campsite, with 116 chalets and mobile homes on the surrounding terraces. The site is not recommended for people with reduced mobility. Domaine des Plantas offers an attractive alternative to those in the more popular southern parts of the Ardèche. The Eyrieux valley is less well known, but arguably just as attractive as those further south and a good deal less crowded, particularly in the main season. This campsite has a good swimming pool complex with covered pool, open air pool, paddling pools and slides for all abilities. A weir that creates a slower flowing section in the river that could be used for bathing and fishing, for which a licence is required. It is a particularly attractive restaurant and bar area with a menu based around wood fired pizza ovens, with other choices available. There is an active animation programme in July and August for children and adults. Two excellent well equipped toilet blocks (one heated) including facilities to please the very young. Washing machines. Motorhome services. Small shop. Bar and restaurant. Heated, covered and outdoor swimming pools, paddling pool and toboggans. Themed adventure play area. Large games area. Pétanque. Well positioned stage for entertainment. High season children’s activities. Many activities and excursions. WiFi (free in bar area). Chalets and mobile homes to rent. Only gas and electric barbecues. Leave A7 exit 15 (Valence Sud). Follow signs to Montélimar via N7 for 7 km. Turn west at D11 which brings you to D86 heading south. Just after Beauchastel, take D120 to Ollières-sur-Eyrieux. Cross river, turn left and follow campsite signs that give reassurance along the (3 km) narrow road which has a few wider passing places (road is only suitable for small to medium vehicles).